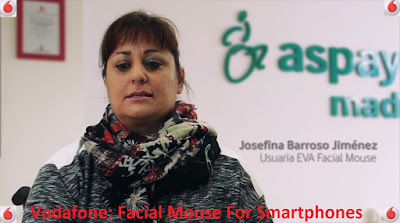 Vodafone India launched an innovative app called EVA Facial Mouse which allows you to control your smart phone with your face. The app was developed by Vodafone Spain Foundation for helping disabled people. This app is available in India on Vodafone’s social app hub and has so far received astounding response from the users. It uses your device's selfie camera to track your face, which allows you to control a mouse cursor on the screen by simply moving your head. The cursor can tap or long-press any element on the screen, and it can even be used to navigate your phone's UI, so you can control your entire device without having to lift a finger. 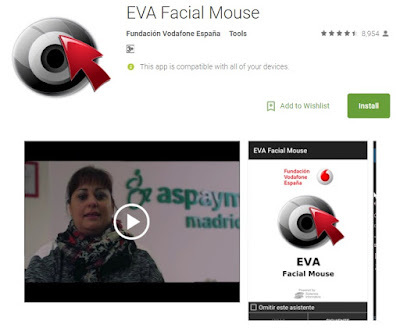 Start by installing EVA Facial Mouse, which is a free app on the Google Play Store. Next, open the app, and you'll be asked to enable the Accessibility plugin. So tap "OK" on this pop-up, then you'll be taken to a system Settings menu. From here, select the EVA Facial Mouse entry, then enable the switch at the top of the screen, and press "OK" on the pop-up. After that, press "OK" to accept the terms and conditions. Then, if you're running Android Marshmallow or higher, make sure to tap "Allow" when prompted to give the app additional permissions. Next, you'll be taken to your device's main Settings menu. From here, select "Language & input," then things will be a bit different depending on what device you have. For most users, just choose "Current keyboard," then tap "Choose keyboards." If you're using a newer device with Android Nougat, select "Virtual keyboards" instead, then tap the "Manage keyboards" button at the bottom of the screen. Next, regardless of your Android version, enable the EVA Keyboard option, then press "OK" on the subsequent pop-ups. When you're done there, back out one level, then tap "Current keyboard" again, and choose EVA Keyboard from the list. If your phone does not have the "Current keyboard" option, simply tap any text input field. From here, a keyboard icon will appear in your status bar or navigation bar. If it appears in your status bar, open your notification tray and tap the corresponding notification. Otherwise, just tap the keyboard icon in your navigation bar. Finally, choose EVA Keyboard from the list, and then you'll be done with this step. From here, head back to the EVA Setup Wizard. If you got booted out to a different screen while setting up the keyboard, you can do this by opening your recent apps menu, then selecting the EVA Wizard entry and tapping your back button two or three times. At this point, the app will attempt to detect your face, so position your device 1-2 feet away from you and angle the front-facing camera towards yourself. You'll see a small viewfinder at the top of the screen, so center your face in this square. When the app says "Face Detected," you'll be ready to move on, so tap "Next." From here, a mouse cursor will appear on the screen, and you'll notice that it follows your gaze. Move your head up and down, and the cursor will follow. If it seems to be moving too fast or too slow, you can use the buttons on the screen to adjust horizontal and vertical tracking speed at this time. When you're done there, you'll get a guide that explains how the mouse pointer works, so read through that, and then finish setup. Once you're done with setup, using the new head-tracking is incredibly easy—just tilt your head up, down, left, and right, then the cursor will follow along. When you want to click an element on the screen, simply hover the cursor over it for a brief moment, then you'll see a pop-up asking if you wanted to click the item or long-click it. Hover the pointer over your choice here as well, and the action will instantly launch. You'll also notice a toolbar on the left edge of your screen. This can be used to perform system actions like navigating back or home. Then, when you're on a page that accepts scroll input, another icon will appear on the screen allowing you to do just that. So every aspect of your phone can now be controlled by simply moving your head and looking at what you want to tap. As per Census 2011, in India, out of the 121 Cr population, about 2.68 Cr persons are ‘disabled’ which is 2.21% of the total population. In an era where ‘inclusive development’ is being emphasised as the right path towards sustainable development, focussed initiatives for the welfare of disabled persons are essential. This calls the need for strengthening and empowering the disabled in India. This is a small initiative from Vodafone for an inclusive growth. Eva Facial Mouse is a free and open source application that allows the access to functions of a mobile device by means of tracking the user face captured through the frontal camera. Based on the movement of the face, the app allows the user to control a pointer on the screen (i.e., like a mouse),which provides direct access to most elements of the user interface. People with amputations, cerebral palsy, spinal cord injury, muscular dystrophy, multiple sclerosis, amyotrophic lateral sclerosis (ALS) or other disabilities may be beneficiaries of this app.